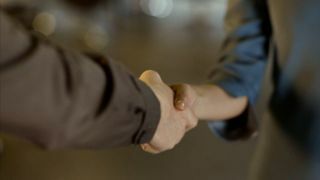 Could your handshake make the password obsolete? A report published by Australian communication giant Telstra reveals that most consumers in the UK want mobile banking applications to instantly recognise them via biometrics such as fingerprint and voice print rather than passwords and usernames. Worryingly perhaps, a quarter of UK consumers questioned said that they would consider sharing their DNA with their financial institutions if it meant making authentication more seamless and keep their financial and personal information more secure. Mobile manufacturers such as Apple and Samsung have already implemented advanced biometrics on their smartphones, but making use of your DNA would be a step too far for many. Coincidentally, those who watched Humans yesterday (C4 in the UK, AMC in the US) would have noticed that the humanoid robot gets activated via a simple handshake that not only collected the DNA but also the fingerprint of the purchaser. Telstra's report also ranked security of finances and personal information as the top concern for the majority of UK consumers when it came to selecting a financial institution. Not surprising when you consider that a third of those surveyed have been affected by identity theft with a significant portion blaming their banks or financial institutions for the mishap, regardless of where the blame actually laid.